Suite 311 is a third floor suite, totally renovated and tastefully decorated, with breathtaking views of Lake Charlevoix. 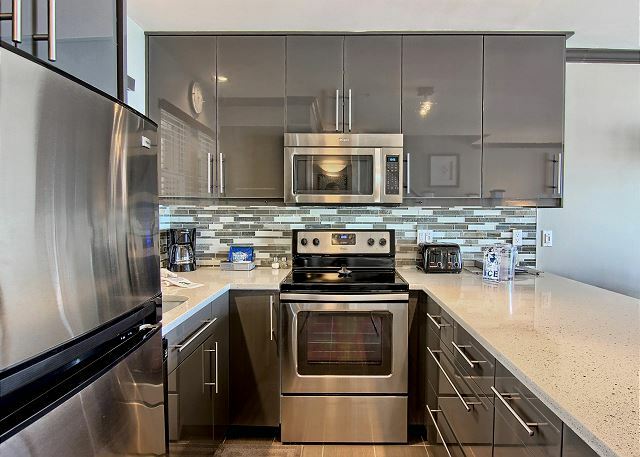 The kitchen boasts beautiful high-end counter tops, stainless steel appliances, and a full size oven. You will find this kitchen fully equipped with utensils and dishes for preparing meals. The glass dining room table can accommodate up to four people. The living room features a queen size sofa sleeper, gas-log fireplace, and a 50'' flat screen TV. The sliding glass door opens to a private balcony that overlooks our private beach. 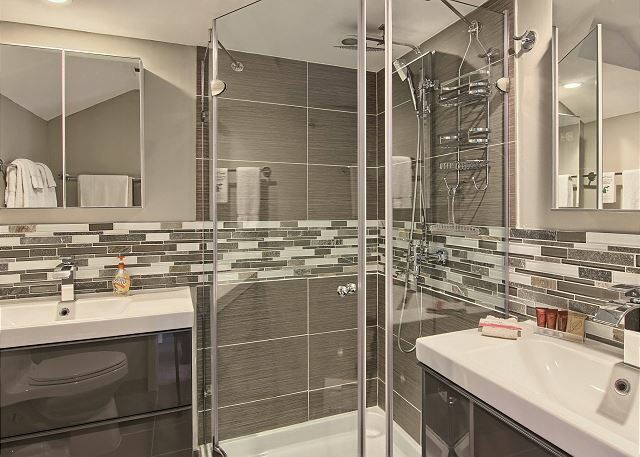 Upstairs you will find a bathroom with a Euro shower enclosed with glass doors and two separate vanities. The upstairs bedroom has a king size bed, a 32'' flat screen TV, and yet another spectacular view of Lake Charlevoix. The property was absolutely AMAZING! Even better than expected, Super clean, great location and anything you need you can always reach the management team and they are super attentive! We stayed here for 2 nights while enjoying winter fun at Boyne Mountain which is under 10 minutes away. Great location just steps away from several restaurants. The condo was extremely clean and looked newly renovated, it was picture perfect and has great views of the winter lake. This place was just the right size for 2 adults and 2 smaller kids. I highly recommend this condo and will certainly stay here again. The staff that greeted us at arrival and when we departed were super friendly and accommodating. All around A+ experience!!! 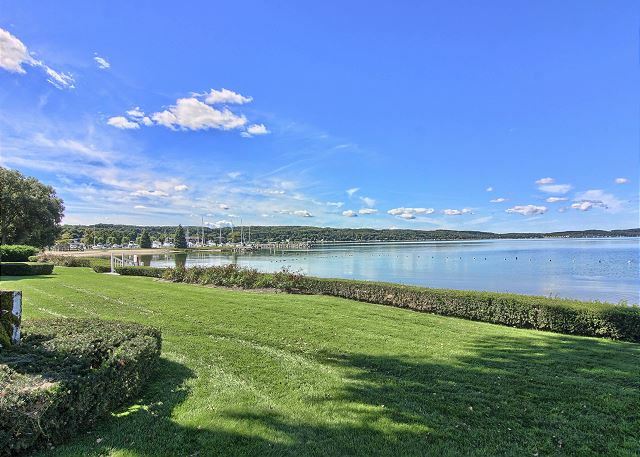 Very nice, comfortable Lake Charlevoix waterfront location with excellent lake views! Didn't utilize the beach at all, other than hearing the waves crash the beach during a snowstorm. I have always loved the sound of water hitting the shore! Very nice condo. Super clean and modern. Only drawback was bathroom upstairs. However, was worth it. This was our second time staying at the Water Street Inn, and they did not disappoint. Always cordial and friendly service. Property is well maintained and very clean. We stayed in a different unit this time and it was wonderfully appointed. We will be back again. While in town, we enjoyed wonderful experiences at Cafe Sante, Red Mesa, Water Street Cafe, Kilwin's and the Bakery. The apartment was exactly as described. Communication couldn’t have been better and we had a wonderful stay. Apartment is walking distance to everything and has lovely views of the lake. Beds were very comfortable. 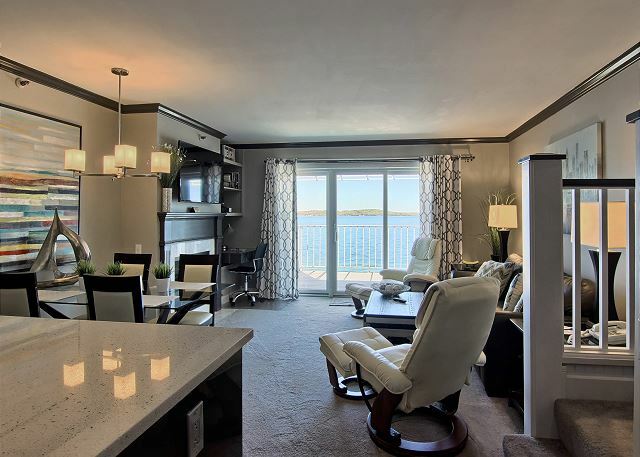 Beautiful updated third follow condo on Lake Charlevoix. Bedroom window as well as the Balcony looks over the sandy beach below and has magnificent sunsets each night as it looks out to the west. Very Clean. Daily housekeeping provided. Staff is exceptional. The owners have definitily thought of everything to make their guests comfortable during their stay. We have stayed here on an annual basis throughout the years our children were growing up. It's been 6 years since we stayed here. They have definitely started cleaning it better, including the beach. We enjoyed our stay very much and can't wait to return in the near future! This was our first family vacation, including our kids, spouses, and grandkids. We had 311, 310,312, and 315 and were very happy with all the units. We stayed in 311 and thoroughly enjoyed it and would like to return in the near future. Everyone was very helpful and the driving directions made it very easy to get to the WSI. The only drawback with any unit was 315 had no upper cabinets in the kitchen and that was an issue for our son and family as they had brought food for breakfast and lunches for the duration of our stay. A sign by the rentals to the north(? )indicating where their property is would be helpful. Our son went over to fish along the rocks and was chastised by one of their tenants. He saw that the same person was mowing both properties earlier in the morning and didn't think anything about it. The property that shares beach area with WSI has a sign so there is not a question. Otherwise it was clean, well maintained and we would definitely recommend it to our friends! We all loved the area and surrounding towns. There were great places to eat, shop and explore. Hope to see you again soon. We loved the rental. Beautiful views of the lake. Beds were comfortable. Room was clean and well maintained. Easy walk to the downtown area to eat. We will definitely be back! We stayed for three days in early June while attending a family Birthday celebration. This property was so beautiful. It definitely reminded me of something you may see on HGTV. I wish I could’ve stayed longer! We've been coming to Water Street Inn for decades. This newly renovated Unit 311 is very comfortable and we will seek to reserve again. Beautiful condo - well furnished. Love staying there, just wish it could be longer. email system for check-in was effortless. This is a great little condo! Everything is updated and has a very nice bed! bathroom it’s also updated a very very nice! Stayed at the Inn to walk back and forth for a class I was taking. Awesome view of the lake, and everyday my room was completely clean. I would highly recommend staying. Nice stay, very clean, will return. The condo was exactly as described. Clean an d beautifull. Wonderful location could walk to restaurants, bars, and shopping. The staff was friendly and there to help when we needed it. This was by far the best place we have stayed for our winter getaway.....would definitely stay again. The staff to the room to the communication was nothing short of amazing. I would recommend to anyone. Although we weren’t in the room much, it seemed very nice. Julie, We are happy to hear you enjoyed your stay at Water Street Inn. We appreciate you giving us some feedback, and hope you can return soon. Warm Regards, Nicole Z.
I found the unit in good condition and well furnished. I have stayed at the Water Street Inn many times and been very pleased with the service and value. The condos are small but very nice and much better than a hotel/motel room for the same price or less. 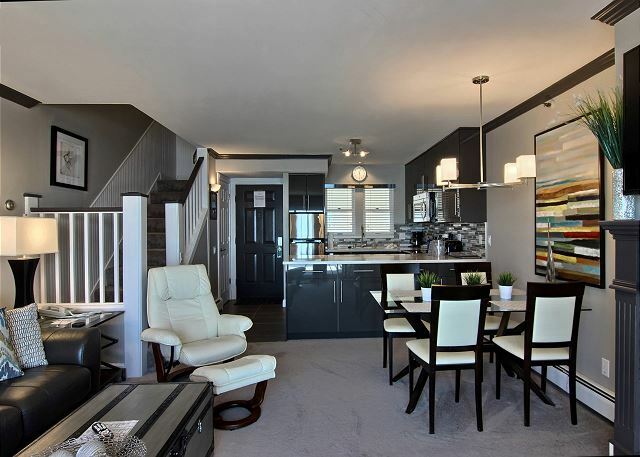 This was a very clean and modern condo with plenty of room. Loved everything about this place especially the kitchen and king size bed. A++ Beautiful space, gorgeous view! We love our condo! We walked in a could not believe how nice it was. 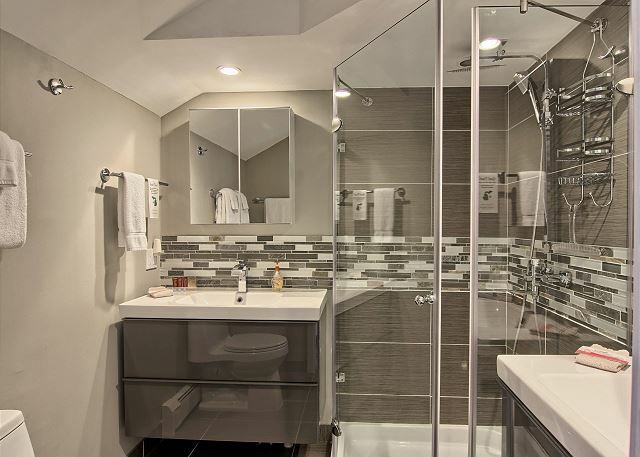 Everything was modern and updated and clean, even loved the sinks and glass shower. The pull out sofa made a great second bed, and the balcony was perfect for watching the sunsets (which were beautiful). Boyne City is a cute little town and next Fall we plan to come back to this exact condo and hopefully stay an extra day. Thank you so much to the owners for providing such a wonderful place for us to stay. Fabulous stay, great views, ideal location. Staff was extremely kind and respectful and condo was immaculately clean! Already planning on our next getaway! The only suggestion I would make is to spray and/or power wash for bugs on exterior windows and doors/siding. Great place! Looking forward to our return. Beautiful condo with Gorgeous view!!! The condo is fully updated and stocked with everything you could possibly need. The bed is a dream and the view is heaven. My husband and I will definitely be returning!!! Nicole, the property manager, was helpful and so kind! This is a wonderful place to stay!!! Highly recommended!!!! Have been going to Boyne City since 1986. It's a real vacation away from it all, serene, relaxing and beautiful. You are sad when you leave. Water Street Inn - Perfect! We stayed for 5 nights, July 2017. Excellent location, beautiful beach and gorgeous view from balcony. We stayed in unit #311 which was very attractive, modern, comfortable and thoughtfully furnished. And spotless - the whole property is beautifully maintained and the staff were all friendly and helpful. Walk to shops, restaurants, book store, etc. We would definitely stay again and recommend. Like home away from home only better! Our 4th stay over the past three years and look forward to coming again next summer. The condo is newly and upscale decorated, comfortable and roomy. Very clean upon arrival and daily housekeeping is a wonderful luxury. Private beach. Beautiful view and sunsets from our balcony. Staff is always courteous and friendly and are always more than accomidating. 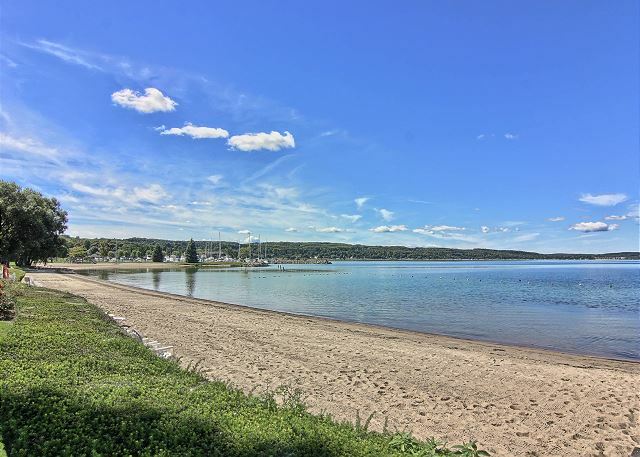 Top it off with the charming town of Boyne City and it is the perfect Michigan vacation destination. Absolutely the nicest people and accommodations you could ask for on Lake Charlevoix. The staff is like family and the condos are all Newley re molded and clean! Love this place! As always the room was great and the staff were amazing. Your staff always has a great and personable presentation. Makes us feel at home. Nicole again made me feel at home with her personality and effort to understand and accommodate our future vacation plans. The condo looks exactly like the picture. It was very clean and well maintained. The bed was comfortable. The view was very pretty out the window. However we were only there for such a short time. You can't check in until 4 pm and you have to leave by 10 am so we were not there long enough to tell if we liked the area. We came to the area to celebrate our wedding anniversary. Boyne City is a lovely little town where we have visited before. The condo is just as the photos represent. It is modern and cozy. A very clean and well stocked unit with a fantastic view of the lake. The sunset was amazing. Although the weather wasn't the best when we arrived, it did clear up for us to get some steps in to walk to town and enjoy the town. Friggy's is a cool bar with good food and a nice atmosphere that is right across the street. This condo is really located at a great spot. The staff was friendly and the check in/ out process was a breeze. If you are on the fence about staying here, jump off and book it. This is way better than a hotel. 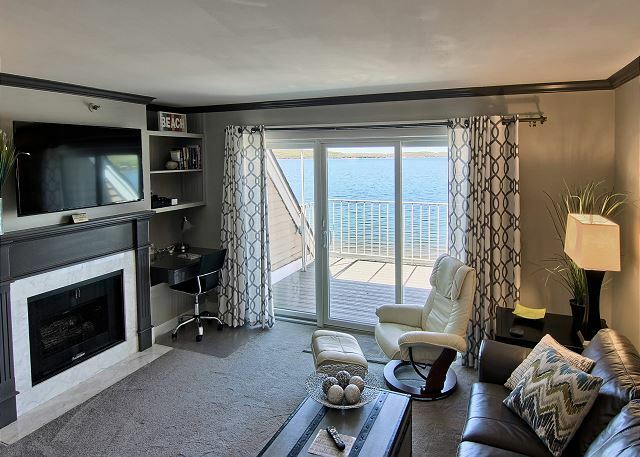 Although Water Street In does not have a pool or hot tub, you get a balcony that overlooks beautiful Lake Charlevoix. Would 100% stay again. Loved it! Very nice place to stay!!!!! had a great time for the weekend, nice price, very awesome place, great view! Great views and a great staff. Friendly and helpful. Easy walk to downtown. I bring my kids up every year to ski and stay at the Waterstreet Inn. We always enjoy our stay there!!! We loved this place. It was very clean, well decorated and had everything we needed. I would definitely go back! Terrific facility and condo. Very close to all Boyne city has to offer, as well as close proximity to skiing at Boyne mtn. As former locals of Boyne we have lots of family still there, we really enjoy Water Street Inn. The staff is always great and it is our favorite place to stay when we visit our friends and family. Not our first stay here and won't be our last. Right on the water and close to downtown. Rooms are always nice but this unit has been remodeled, so we tend to choose it more often. One feature we like is the bedroom is upstairs. The staff is always friendly and the heyless entry makes it nice, not having to carry a key around.